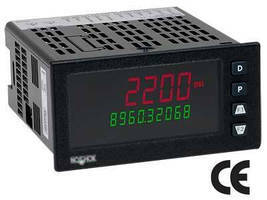 Dual Display Digital Indicator accepts range of input signals. FeaturingÂ dual display with tri-color and variable-intensity digits, 2200 Series accepts variety of input signals –Â thermocouples or RTDs, current, voltage, resistance, and process signals – and offers meter update rate of up to 160/sec and 24 Vdc sensor excitation. Universal power input accepts AC or DC voltage, built-in USB port allows configuration via computer, and plug-in option cards are available for field upgrades. Interface software is also available. Berea, Ohio – NOSHOK announces the availability of a new addition to our "Smart System" offering of digital indicators – the 2200 Series Dual Display Digital Indicator. This new NOSHOK digital indicator accepts a wide variety of input signals including thermocouples or RTDs, current, voltage, resistance and process signals, and features a dual display with tri-color and variable intensity digits. The NOSHOK 2200 Series Dual Display Digital Indicator has a universal power input accepting either AC or DC voltage and 24 Vdc sensor excitation, a meter update rate of up to 160/second, and a built-in USB port for configuring with a computer. Plug-in option cards are available for field upgrading, and interface software is available on request. Applications include pump control and monitoring, liquid level measurement, heating and cooling, force measurement, cycle counting, and flow rate measurement. For more information on NOSHOK products, please visit our website at http://www.noshok.com.